Collections Are Harder To Sell Than You think! This is #7 in the collection of 10 Things To Expect When Downsizing! See links to previous blog posts below or to the right. Lots of us love to collect items over time. Popular collections include stamps, baseball cards, coins, thimbles, spoons, plates, snow globes, glass wear, sports memorabilia, and even buttons. The value of each collection is different and the factors that influence selling prices are innumerable. Some items are special only to the collector and some are highly sought after. When downsizing and considering what to do with your collection, the most important thing to remember is: you likely value the experience of gathering your collection much more than any monetary value you may gain upon selling it. Hopefully you have displayed your collection and enjoyed it! When it comes time to sell or gift any collection, it can be harder than you think. It is important to document what you have, especially if your collection holds a large monetary value. You probably know more about your collection than anyone in your family. Remember that someone may need to make decisions on what to do with your items without your assistance. Here are a few things to do now! 1) Document! If your collection holds a significant monetary value – document! You need to be sure that you know what you have and what it is worth by today’s standard. Write down details with serial numbers, places purchased, dates, and any specifics that make it rare or sought after. Be sure you leave this information readily available for anyone that will be left with your collection. If you intend to sell it yourself this information will also be very helpful. 2) Keep lists of interested parties. Identify people that deal in your particular collection. Make it your job to find dealers and other collectors that know and value what you have. Maintain a list of these folks with your value documentation and update it often. This is a great place to list people that have expressed interest in your collection over the years as well. The hardest part of selling a collection is finding people that collect what you have. A ready list will be very useful later. 3) Keep it all together! If you have parts of your collection stored in the attic or a closet somewhere – be sure to document that as well AND tell family members. It is always best to keep your collection together in one area but sometimes that is not possible. If you have spare parts or pieces of a collection be sure they are well marked as someone else may not have any idea what they are looking at when cleaning out an area! Lots of hard-to-replace pieces get thrown out or recycled if not labeled. 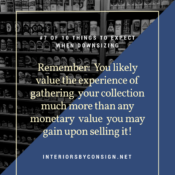 If you are downsizing now and want to sell your collection the above steps will be helpful in finding buyers and placing a value on what you have. Reputable dealers are the obvious first people to contact. The internet is a great resource here. Do your research and check out reviews and information about dealers, auction houses, and resale sites before you give them any information. If you intend to gift your items to someone in your family or a friend, speak to them about it now. You may find that the person you had in mind is not interested. It is very difficult to find someone that cares about a collection as much as the original collector. Don’t assume your granddaughter will love your Hummel collection just because she once admired it. A little planning now will pay off later in peace of mind. At Interiors By Consign we do not accept collections.We just don’t have the room! We do occasionally take a limited amount of artwork if it is the right artist/theme/color/size. If you have artwork you would like to consign, please contact us @interiorsbyconsign.net to discuss. If you are not yet moving or downsizing and you have not displayed your collection – do it now! Collections make a home interesting. They say something about the people that live there that others may not know. Collections always look better grouped together rather than scattered all over the house. Take a look around your home and see how you can best display your items…AND be ready to answer questions about where you found them and why you love them. These stories are often what connect the next generation to your items. Display your favorites, tell the stories and enjoy what you have spent so much time gathering! 7) Collections are harder to sell than you think!